Webinars offer an effective and convenient way to learn. With our live webinar training, you will be able to interact with the instructor and your peers. Many of our webinars are also available ON-DEMAND, allowing you to view a recorded webinar when it's most convenient for you. 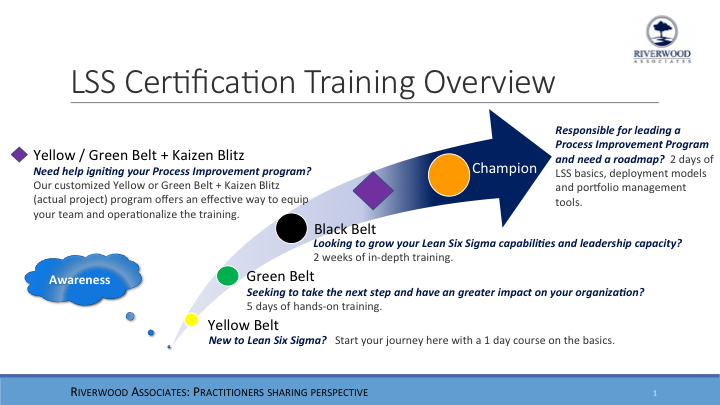 Are you new to Lean Six Sigma and thinking about becoming certified? Is your company rolling out a Lean Six Sigma program and you want to know more about it? If so, you won’t want to miss this webinar. We’ll define Lean Six Sigma, share examples, describe how it works and explain how you will benefit. Are you optimizing your portfolio of process improvement projects? Are your project teams frustrated because of poorly defined project goals and scope? In this interactive webinar, you will learn to evaluate and select the right projects using proven techniques and tools; learn how to create a powerful project charter by focusing on the right things (defining the problem, identifying the project goals, and scoping the project. Includes Excel-based tools and templates. In today’s lean, flat organizations, it is everyone’s job to effectively solve problems. Successful problem solving requires strong analytical skills including defining the problem, forming a hypothesis, breaking things down into their component parts, categorizing and prioritizing data, identifying potential causes, and isolating / verifying root causes. It also involves superior deductive reasoning skills – applying logic trees and drawing conclusions from given scenarios. In this webinar, Peter Sherman will guide you through the Problem Solving Framework. You will learn how to define a problem, form your hypothesis, and use key tools to test the hypothesis in order to make better decisions. Includes tools and templates of the complete Problem Solving Framework. Are you frustrated with not getting your projects approved and funded? Perhaps you’re not speaking the “language of management” – cost savings, ROI, payback period. In this webinar, you’ll learn how to identify the types of cost savings, how to read a P&L, and how to prepare a Business Case. Specific topics include how to calculate and interpret key metrics including the “Cost of Doing Nothing”, Return on Investment (ROI), and Payback Period. Includes tools and templates. Gemba Walks are central to any Process Improvement program. The Gemba Walk is one of the most effective means to improve quality, productivity and safety in a plant or office. In this 60 minute webinar, Peter Sherman will define what a Gemba Walk is and is not, identify critical questions before starting your Gemba Walk program, and provide a comprehensive set of Gemba Walk guidelines to start your program immediately. Includes tools and templates. Are your employees making poor decisions based on information that was relatively expensive to collect? Are they data hounds who want to see the data? Or do they go generally make decisions based on their intuition? In this interactive presentation, Peter Sherman will explore our decision making styles, share compelling research on analytics with business examples and present a simple but powerful decision support system to help you make better decisions. Attendees will participate in an enlightening diagnostic survey about their own decision making style and receive powerful tools for decision making.